National Dietitian's Day - March 18, 2015 | Health Stand Nutrition Consulting Inc.
Today is National Dietitians Day! Canadians say it’s a challenge to eat healthy at work and I think many of us would agree. For National Dietitian’s Day, I’d like to share one of my favourite go-to healthy and delicious snacks which are my nutty chocoholic balls. Make a batch for yourself and keep them in the freezer for when you need something quick and easy to snack on. 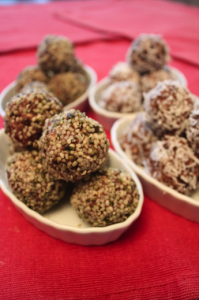 Click here for a printer-friendly PDF of the Nutty Chocoholic Balls recipe.